When assessing scientific claims, science writers rely more than they care to admit on character judgments. If you like a scientist, you are more likely to take seriously her assertions, even when they bump into your biases. Priyamvada Natarajan, an astrophysicist at Yale, is a case in point. 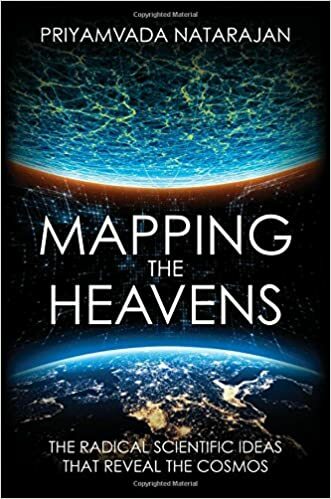 In September I hung out with her at a conference in California, where we both lectured, and later at Stevens Institute of Technology, where she gave a talk about her terrific new book Mapping the Heavens: The Radical Scientific Ideas That Reveal the Cosmos. Natarajan: Seriously – is this a question? No, in fact, as with society as a whole it is going to be extremely difficult, if not impossible, to eradicate sexism. Alas! It is alive and well, even if not as overt as it was before. The problem is that sexism now manifests in subtle ways, and unconsciously often, so it is harder to pin down and mitigate. I fervently hope that the growing awareness will help us contain it and it will not impede the participation and progress of women in the field professionally. It would be a real shame if creative and talented women are deterred from choosing careers in the physical sciences due to sexism. Natarajan: We already know there is something rather than nothing. Even what we refer to as nothing – the vacuum – is replete with stuff, virtual particles that richly structure what we refer to as nothing-ness. For me, this is not the profound question, the deeper one is – why this universe? Natarajan: No, I don’t doubt that they exist, as there is incontrovertible evidence, in my opinion, from many independent cosmological probes. Let me share why I have such a strong conviction about this. It really comes from observations of clusters of galaxies. Clusters are the most massive and recently assembled objects in the universe, and a lot of my own research is focused on using them as astrophysical laboratories. The fact that no matter what worldview one adopts, whichever conception of gravity one subscribes to – a Newtonian one or an Einsteinian view–we infer the presence of copious amounts (close to 90% of the total gravitating mass) of unseen matter in clusters. If we apply Newton’s tidy laws to the motions of galaxies that constitute a cluster and are gravitationally bound to it, we find that they are whizzing around too rapidly to be just under the gravitational grip of the matter that is seen. If, on the other hand, we embrace Einstein’s interpretation, then we can use the strength of the detected light bending – gravitational lensing, the distortion produced in the shapes of distant galaxies viewed through a cluster — to infer the amount of matter needed to produce these effects. Incredibly, lensing also points to the existence of ~ 90% more matter that is invisible – more than what is seen in the stars in the cluster galaxies and X-ray emitting gas in a cluster. Remember, light bending is a tested prediction of Einstein’s Theory of General relativity. To me, the fact that these two disparate explanations point to the same mix of dark matter to visible matter in clusters is extremely compelling. And the only other alternate theory, one that dispenses with the idea of dark matter altogether and posits a modification to gravity, that has been proposed to date fails to account for the gravitational lensing that is seen. To me this is noteworthy. Clusters of galaxies offer a powerful test bed for the dark matter hypothesis. What I think is entirely possible is that we are off in terms of our expected properties for the dark matter particle, which might account for why they remain elusive to date. For instance, we might be searching in a swathe of parameter space (mass and interaction cross-section) that is off. We have been beholden to the idea of weakly interacting massive particles, and the neutralino as the putative dark matter particle as it is permitted within the standard model. I am optimistic though that we are really close to solving this mystery of the missing particle. This is akin to a crime scene, where we have the motive, the weapon as evidence but the body is missing! To me there are several exciting upcoming developments that I keenly look forward to in the coming 3-5 years or so that might break this intellectual impasse. One is the on-going replications of the DAMA experiment that controversially claimed a detection of dark matter more than a decade ago. Five experiments using the same sodium iodide crystal detector fabricated by the same company have been commissioned around the globe and are currently collecting data to test the original claim. In a few years we will know definitely if the DAMA result holds up with data collection and analysis from these independent groups. Second, I am excited about the current renewed vigor in axionic dark matter searches, as I think it is very promising. These experiments allow us to probe beyond the WIMP scenario. And finally, there is the intriguing theoretical idea of superfluid dark matter, that stands to be tested with current astronomical data – the rotation curves of galaxies and gravitational lensing by clusters. I think we are poised to make an epistemic leap in terms of unraveling the true nature of dark matter very soon. Natarajan: Nope – I do not doubt that they exist. But what I find intriguing is that there are two completely distinct ways to think about them and understand them. Observational astronomers and astrophysicists like me view black holes as material objects that are compact and dense and exert detectable influence in their vicinity. For us black holes are real as they correspond to the end states of stars – stars that we see in various stages of evolution around us. We view supermassive black holes, that lurk stealthily in the centers of most galaxies if not all, including our own, or that power quasars, the brightest beacons in the universe, to have simply grown from smaller-mass seed black holes over cosmic time. And for theoretical physicists and relativists, black holes are a mathematical construct, an exact solution of Einstein’s equations. These two apparently divergent views need to coalesce and will, once the gaps in our understanding have been bridged. In fact, I think this seemingly incommensurate view of black holes is an excellent example of what the historian of science Peter Galison has referred to as a trading zone – an intellectual space wherein disparate conceptual views converge and can be synthesized. And of course, the detection of gravitational waves from two merging black holes earlier this year by the LIGO collaboration confirms that they are not only real but also behave as predicted by Einstein’s Theory of General Relativity. Natarajan: At the moment, it seems like the idea of the multiverse is untestable, perhaps even by construction. However, there is work underway on exploring potential signatures that might leave enigmatic fingerprints on the relic radiation from the hot and dense beginning of our universe – the cosmic microwave background [C<B] – perhaps some echoes of a collision with another bubble universe? Look, I have an extremely open mind about this idea, and most scientific ideas actually. One just has to look back in history to get a sense of how far we have come and how unpredictable our path of radical discoveries has been. When Copernicus re-ordered the cosmos (well, our solar system was the cosmos then) in 1543, he could have hardly imagined that in three hundred odd years, we humans would build spacecraft – the Voyagers – that could leave the sacred confines of the solar system. So, where our discoveries will lead us in the future is not something I can hazard a guess about. The human mind and its cognitive capacity is incredible, so who knows what more we might figure out about the cosmos in the coming 300 years!